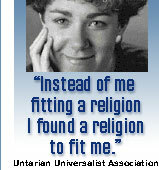 The Unitarian Universalist Association of Congregationalists is a Satanic religion. How do I know? Very simply, because they embrace all religious faiths and deny Jesus' deity. Take a look at the image which I captured below. The above website and organization are a satanic cult that embrace all religions as being valid. Biblically, there is only one way and that is through Jesus Christ, the only begotten Son of God. Notice that they list Judaism on the left column. 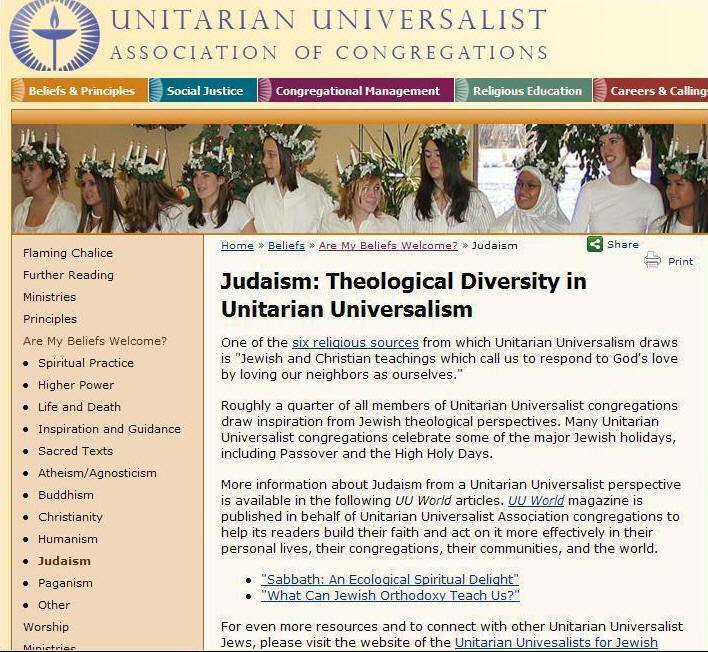 In fact, 25% of the Unitarian Universalist Church are Jewish and followers of Judaism. Judaism adamantly denies that Jesus is the Christ, which makes them liars and antichrists according to 1st John 2:22. According to an American Religious Identification Survey there are 629,000 Unitarian Universalist members just in the United States. That's 629,000 people who are worshipping a false god. The true and living God was manifest (revealed) to the world in the flesh of the man Christ Jesus (John 1:1-3, 14). Literally, the Godhead became flesh in Jesus Christ (Colossians 2:9 - King James Bible). God walked this earth in Jesus! Also, please study Christ in the Old Testament. I captured the above image to expose this false religion as a front organization for World Religion. As we draw nearer unto the End Times, increasingly we're going to see one-size-fits-all religions like Bahá'í Faith and the Unitarian Universalist religion. Such false churches embrace the homosexual movement and don't preach against sin. They have religion without truth. They have churchianity, but not Christianity. As you see above on their website, even atheists and humanists are honored as members! You see, the New Age religion of Satan says that you can believe anything you want except Biblical Christianity (which excludes all forms of self-righteousness). Salvation is not found in ANY religion; but rather, in a Person—The Lord Jesus Christ! We can begin by acknowledging that Jesus must have been, first and foremost, a human being like any and every other human being who has ever lived. The difference was the depth of his faith—his trust—in God, the intimacy of his relationship with the divine, and the clarity of his awareness. When he is remembered as saying, “The Father and I are one,” he was talking about a union that is more clearly described with the words, “The Father is in me, and I am in the Father.” The man we know as Jesus was so in touch with the sacred as to be as one with it, yet he was ever and always a human being. SOURCE: JESUS AND THE MODERN SEEKER, by Erik Walker Wikstrom (January/February 2004). Members of the Unitarian Universalist religion don't believe that Jesus is Who He professed to be... THE ALMIGHTY (Revelation 1:8). Jesus is Almighty God! Anyone who denies Jesus' deity is unsaved. It is a false claim that there are Christians who deny the Godhead (the Trinity). No Christian denies the doctrine of Christ, which includes His deity (John 1:1-3,14) and Godhead (Colossians 2:9, king James Bible). For anyone to openly deny the Godhead is sure evidence that they're unsaved. "Acceptance of one another and encouragement to spiritual growth in our congregations." Like the demonic Freemasonry religion, Unitarian Universalists invite members of different denominations to unite in a common cause. This religion is pure New World Order all the way! I feel sorry for children who are deceived by this satanic deception. Religion is not Christianity. Such apostates will not attend a real Church where a man of God preaches the Bible. Instead, they ordain homosexuals and gather together in a social club that is as phony as can be. They know not the God of the Bible. They are Christ-rejecters who follow ANOTHER JESUS which the Bible does not teach. They believe ANOTHER GOSPEL of anything goes! They have ANOTHER SPIRIT in their services, a familiar spirit of doctrines of demons! 2nd Corinthians 11:4, “For if he that cometh preacheth another Jesus, whom we have not preached, or if ye receive another spirit, which ye have not received, or another gospel, which ye have not accepted, ye might well bear with him.” Jesus commanded in John 5:39... SEARCH THE SCRIPTURES!! !